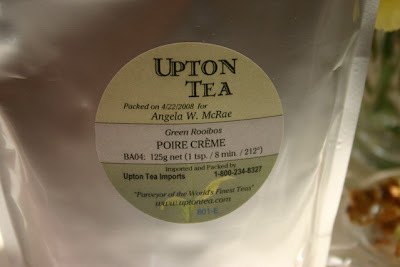 Here you can see where I quickly tore into one of the sample packets in my Upton Tea order that arrived last week. 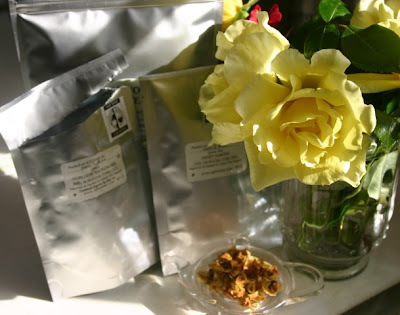 One of the samples I was most looking forward to trying: the Organic Heirloom Tea Flowers shown here. 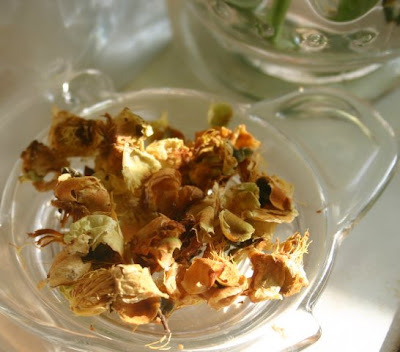 Here's how Upton describes this tea: "An unusual tisane made solely from organic Camellia sinensis flowers, which are carefully plucked from heirloom tea bushes in full bloom, and then sun-dried. 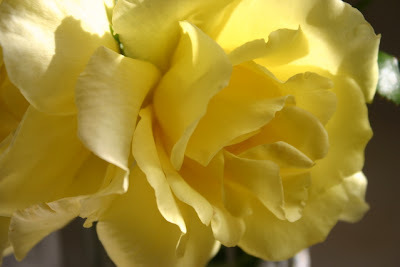 Tests show the flowers to contain similar amounts of catechins and polyphenols as regular leaf tea, but with a significantly lower caffeine content. The flavor is surprisingly full, with notes of honey, caramel and citrus." My palate isn't refined enough to detect "notes" and requires more of a loud "symphony," so I have to say that while I wouldn't have used those words to describe the flavor, I do agree it had a very "full" taste, a richer, more pleasant flavor than I expected. I never have to go in a crafts store again. On Sunday, I was looking for a particular piece in my little crafts room and ended up looking through every single crafts container. Twice. That included two huge bins of fabric, about five crafts totes bearing assorted projects already in progress, and perhaps a dozen assorted containers of laces, ribbons, threads, fibers, buttons and trim. And going through all that "stuff" did two things for me: 1) It cured me of needing to go in any crafts stores for a while and 2) it showed me that I've actually been "into" the tea theme for longer than I realized. 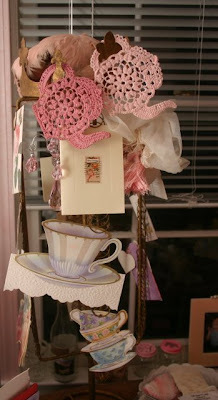 So I thought I'd share some of my crafty finds, including one of my most-used pieces, the teapot pincushion above. 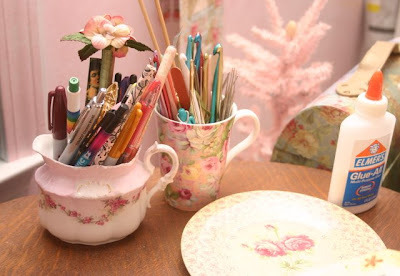 An orphaned cream pitcher and a slightly chipped chintz mug are containers for pens and crochet hooks. That pretty bowl I found last year but couldn't figure out what to do with? It holds buttons, including a green teacup button that will be the perfect accent on some tea-themed piece. 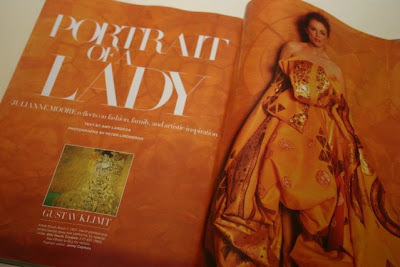 Several years ago, crafts magazines started showing various styles of letters covered in fabric, buttons, glitter, or otherwise embellished. I've not decorated these yet, but just know they will come in handy someday! It's hard to see, but underneath the cards and hat, this rack with a crown on top was actually a new piece I bought to display Christmas cards last year. It occurred to me it would be good to use it throughout the year as well, so now it decorates the crafts room and holds favorite cards and memorabilia, including the crocheted teapot doilies that were a gift from my friend Kathy. 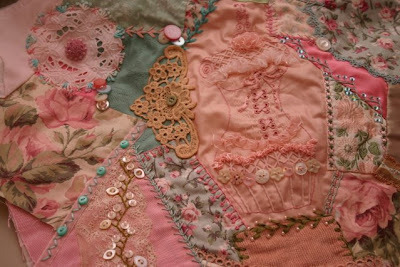 For about five years, I worked pretty steadily on a pink and green crazy quilt. Then one day, I'd had enough of that and just put it down. But I was so close to being done! Looking at the blocks this weekend reminded me of how lovely this would be if I would just finish it. 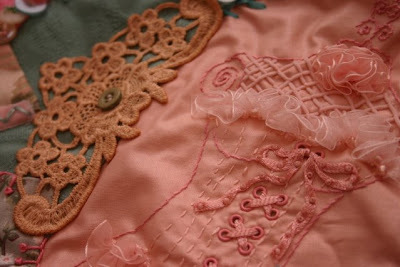 The corset pattern is something I copied off a rubber stamp, then embellished with velvet threads, buttons and organza ruffles. 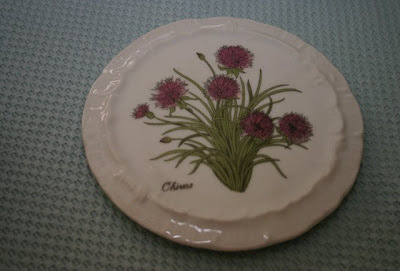 I loved making it, but that perfect piece of lace next to it was just SO starkly white. I tea dyed it, and voila, the softness I desired. 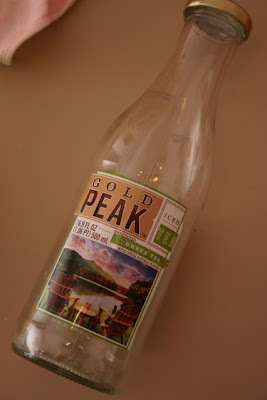 One day last year, I actually went IN a convenience store to pay for gas (almost never happens anymore thanks to pay-at-the-pump), and I walked out with this bottle of Gold Peak green tea. I like the design of the bottle and decided to keep it. Maybe it'll hold paper flowers one day? My inspiration board, an old dresser mirror with the "mirror" now made of cork, holds tidbits I mean to do something with. 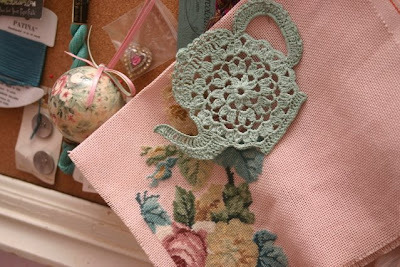 Finishing this needlepoint rose pillow suddenly appeals to me, and I just love finding all these teapot doily pieces. 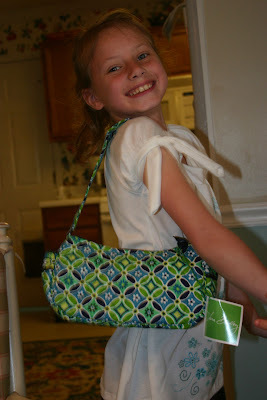 And for carrying around all these crafty goodies? 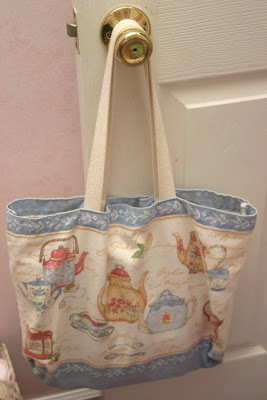 This tea-themed tote bag, once a gift from DH. 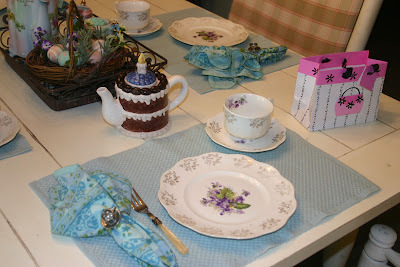 I wish you all lived nearby, because we could all meet up in the crafts room and work on tea-themed crafts together! Are any of you members of e-rewards.com? I don't even remember how I got invited to join, but by answering a few of their surveys every now and then, I have earned quite a few free magazine subscriptions. The titles are some good ones, too: Newsweek, Hallmark, Interview, This Old House, Smithsonian, and even the fashion magazine Harper's Bazaar, of which I am not, ahem, a typical reader. 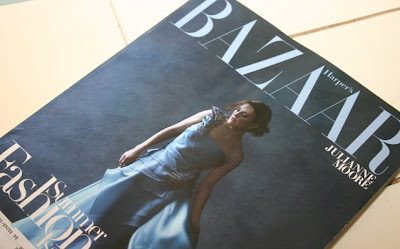 Though I have enjoyed reading the celebrity stories, I can hardly see myself ever wearing some of Harper's Bazaar's, well, rather bizarre fashions. But amazingly enough, I actually went out and bought an item I saw in the current issue. I'll let you guess which one it was. 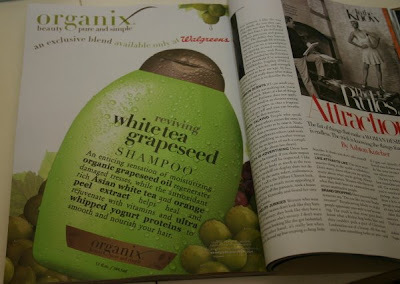 Or was it ... the Organix Reviving White Tea Grapeseed Shampoo shown in this ad? In my neck of the woods, we treasure hunters know that Spring has officially arrived when our mailboxes start seeing more of those little blue postcards from Collins and Wood, the well-known local appraisers who've long been known for staging estate sales. 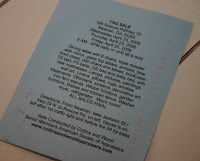 I've gotten several bargains at their sales over the years, so I was happy to see this blue postcard the other day. I pulled up to the house Wednesday morning and didn't really pay attention to the exterior behind the sea of cars, so eager was I to find a parking place and get going. 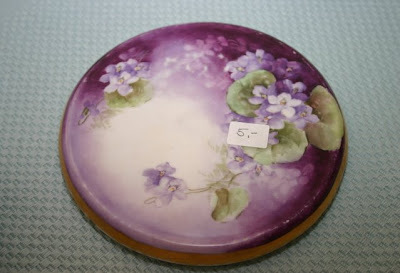 On a shelf outside the house, I found the wonderful handpainted tea trivet above, which will certainly go well with those violet dishes I got at the Carriage House a while back. I also found a nice quilting book, and only when I was leaving the house did it dawn on me: a friend of mine's mother used to live here before she moved to a retirement village, and I once wrote a newspaper feature about her quilts! 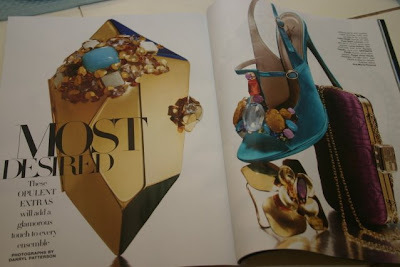 I was so happy to realize she was the original owner of these great items. 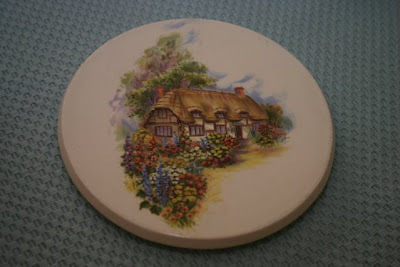 Later, it occurred to me I have never mentioned my tea trivets, those lovely and quite utilitarian objects that keep teapots from scratching the dining or tea table while guests are using them at tea. 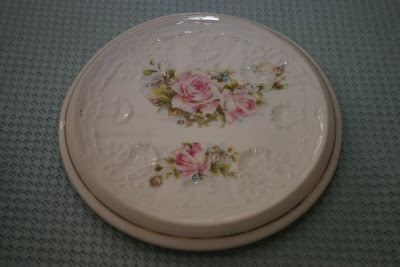 If I don't have a teapot on some sort of elevated tray, I like to have it on a tea trivet (also known as a "tea tile"). I now have four, but only four, since I don't see these pieces at shops and sales very often. And now if you'll excuse me, my sweet husband has just loaned me some of his hard-earned cash so I can hit a multi-family yard sale on the way to work this morning. 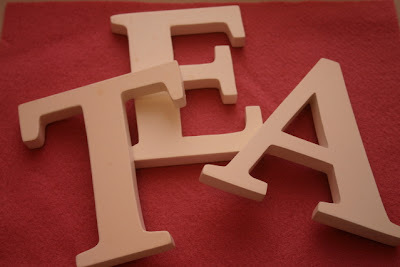 Maybe I'll find another tea trivet! 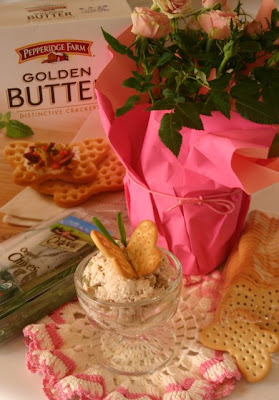 Those of you who read Southern Living, did you notice the cute little appetizer on page 14 of the April issue? It was an egg cup with Spicy Roasted Red Bell Pepper Pimiento Cheese served with a darling "butterfly" garnish, and the minute I saw it I was on a quest to find egg cups so I could serve something like this to guests at a tea party. I learned pretty quickly that the local antique malls don't have many egg cups, and the ones on eBay either didn't impress or were too expensive, so I was then on a quest to find some small glass dishes that would serve the same purpose. I came across eight of these small (2-1/2-inch tall) glass sherbet type dishes at a local thrift store for a song, so I was ready to try for The Butterfly Effect. 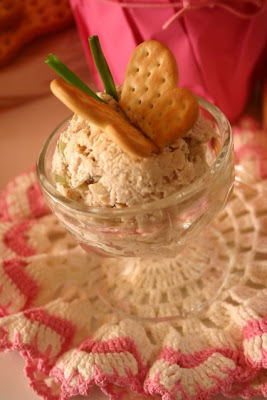 Southern Living used a gussied up pimiento cheese, but I decided leftover chicken salad (a large ice cream scoop full) would suffice. The crackers are Pepperidge Farm Golden Butter crackers, and I'm happy to report these are sturdy and you can break the butterfly right down the middle in one try. 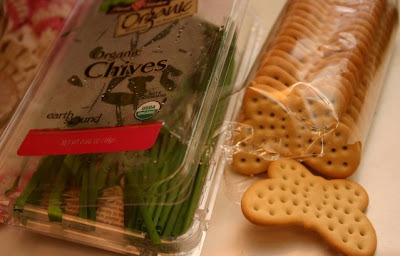 Using kitchen shears, I cut two pieces of chives, each about 1-1/2 inches long, and used the tip of a sharp knife to gently stuff them down into the chicken salad. Now is this cute or what? Thank you, Southern Living, for the quick and easy idea! Tea and taxes are inextricably linked in our great nation's history, and I can't help mentioning this fact today for two reasons. 1) I just got through spending a teeny-tiny little bit of my and DH's tax refund (really, darling, it was negligible!) on some tea-related treats. 2) Today is Tax Freedom Day. That, policy wonks tell us, means that today is the day on which, theoretically, the average American worker has worked enough to cover all of their federal, state and local taxes for the year. Yippee! To celebrate, a little retail therapy is certainly in order, and I suggest a visit to one of downtown Newnan's newest gift shops, M. Cole Design on West Washington Street. 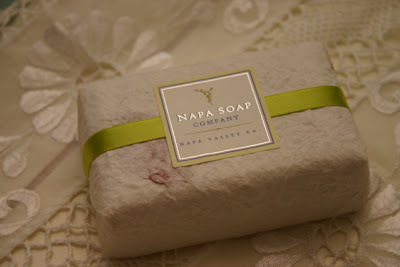 This Napa Soap is my favorite find and is quite possibly the best-smelling soap I have ever found. 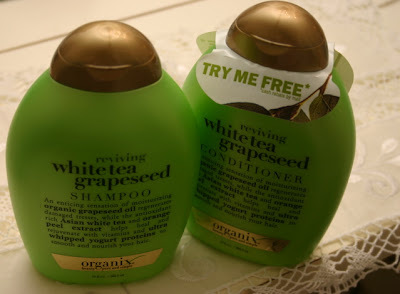 It doesn't actually smell like green tea to me, though, but rather some light, heavenly, lily-of-the-valley-ish fragrance, like a just-picked garden flower. According to napasoap.com, "Whenever possible, we use local ingredients from the Napa Valley in an effort to share the beauty of this unique area. Our grapeseed oil and grapeseeds are a by-product of the wine industry. Our lavender and herbs come from a variety of gardens in the area. 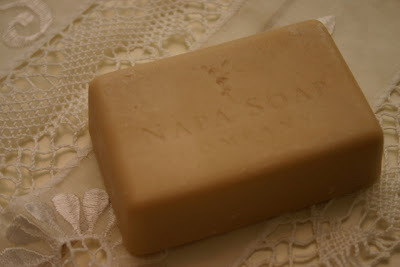 Our beeswax and honey is harvested in the heart of the Napa Valley, and we even use Napa Valley wine to make our Cabernet Soapignon and Soapignon Blanc bar soaps." 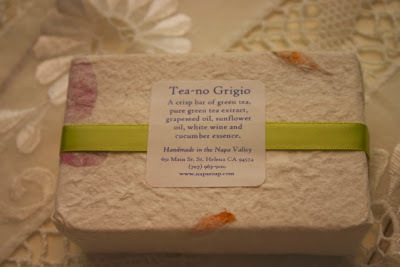 I chose the Tea-no Grigio Soap because in addition to smelling absolutely divine, it contains green tea and green tea extract. 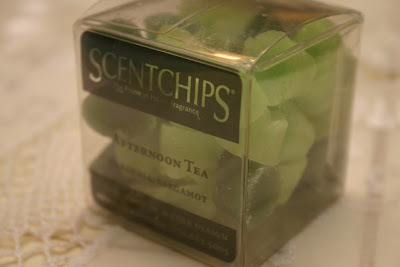 Another find was these Scentchips, a new fragrance product I'd read about but never tried. 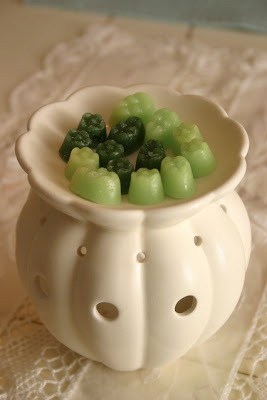 These are little scented wax chips, shaped like leaves and flowers, and you can use them as potpourri or in your tart burner. The clever thing about these little treats is that you can mix and match them to get a scent that's just what you're looking (smelling?) for. I was poking around in the bins of various scents when I saw one of the pre-packaged versions marked "Afternoon Tea," so naturally that's what I got. It's a combination of their Gardenia and Bergamot chips, and I'm just quite intrigued that bergamot - the citrus fruit that provides the bergamot flavoring in Earl Grey tea - has made it this far in the fragrance world. When I got home from work, I popped my tart burner in the freezer for a few minutes to loosen the old tart it contained so I could use some Scentchips. Soon my husband was asking about the wonderful scent. For those of you who don't live nearby, you can find out more about these chips at scentchipsusa.com. Some wonderful handmade tea gifts! The gift of needlework is one I have long enjoyed giving. I've made afghans and doilies, pillows and Bible covers, Christmas stockings and bookmarks, and it has been very rewarding to be able to give these gifts. 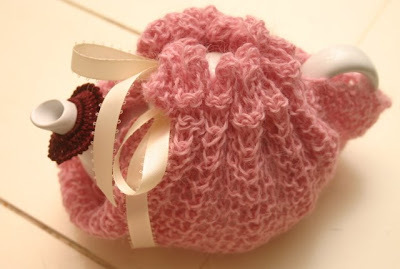 I just love browsing through a shop for yarn, fabric and threads, and there's something very fulfilling about knowing your own hands used these simple things to make a gift for someone else. And I've said all that to say this: Because I know how much work and care goes into a handmade gift, I am an especially happy recipient of handmade gifts, because I truly do treasure them. And so when a "mystery package" arrived at the office one day last week, I opened the package and tissue paper verrrrrry carefully. Dana in Atlanta had e-mailed that she was sending me something ("What? What? What?" I had immediately thought), and I knew it was going to be appreciated and welcomed no matter what, but then the package arrived and I opened it to find THESE! She knit the tea shawl, which perfectly fits a personal size teapot, in llama wool, and I hope my photo allows you to tell something of the wonderfully soft texture of this piece. I wish you could touch it through the Internet! (And how did she guess that pink is my favorite color!) 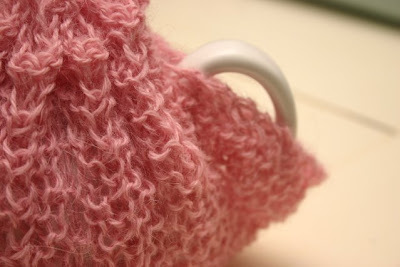 Along with the shawl came a crocheted tea collar, which is placed on the teapot spout to discourage dripping and stains. I am sooooo enjoying using these delightful pieces, and more than a little humbled by the kindness of the one who took time to stitch them for me. 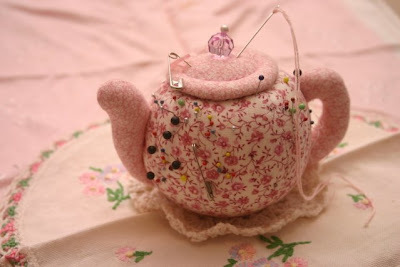 Makes me want to start crocheting and knitting and quilting some tea-themed gifts of my own! 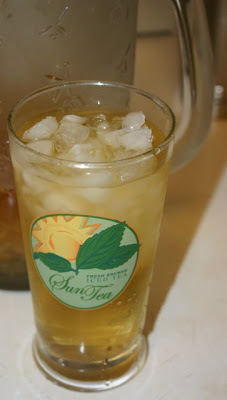 We had gorgeous weather yesterday, and with temperatures here in Georgia in the mid-seventies this week, I'd say that the time for iced tea has definitely arrived. 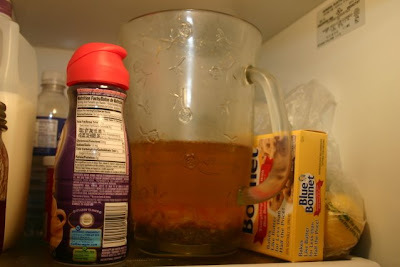 My favorite way to make iced tea is the refrigerator method, where you simply let the loose tea "swim around" in a pitcher in the refrigerator overnight. 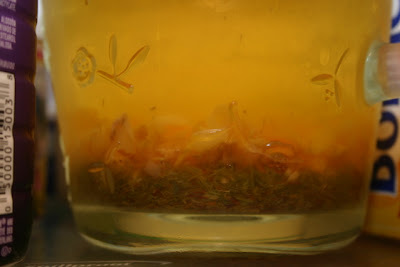 This is a closeup of the fridge tea version of Teavana's Key Lime Rooibos, which the company describes as "a tropical blend of green Rooibos, papaya, mango, peach, citrus, rose and marigold flowers." I've made everything from plain black teas to flavored teas and green teas by this method, but I think the fruity/citrusy teas are my favorite. Although this wasn't "Sun Tea," I still enjoy using this glass I found at World Market last year: "Fresh Brewed Iced Tea Sun Tea." And I realized the tea selection around here has gotten pretty boring lately, so I ordered some new varieties from Upton Tea over the weekend. Hopefully, soon I'll have some new teas - and refrigerator brewed teas - to share with you! The thing I like about both these spreads is that they can be made ahead, which is something I very much like to do when hosting a tea. 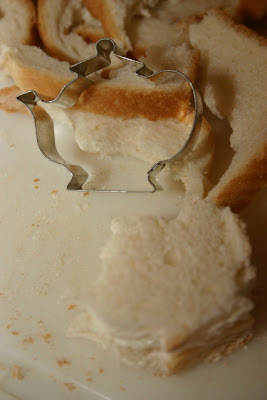 When I make the Cucumber Cream Sandwiches, always with white loaf bread, I like to cut out bread shapes with one of my teapot cookie cutters to make them a little more special. 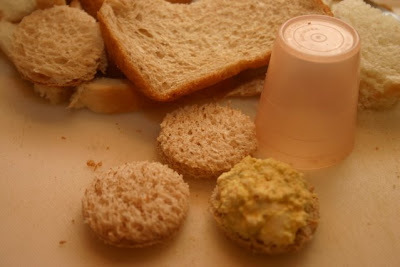 For the Egg-Olive Tea Sandwiches, I cut out wheat bread using a tiny (about 2 inches tall) old Tupperware cup. Women "of a certain age" will remember these pastel colored cups, which make perfect little circles for these sandwiches. Place all ingredients in food processor and pulse a few times, just 'til blended. (You don't want the cucumber completely liquified so that you can still enjoy some of the crunch.) This recipe makes enough spread for about 2-3 dozen small (1-1/2 to 2 inch) tea sandwiches. Place all ingredients in food processor and pulse a few times, just 'til blended. If you like olives, you will love this spread! 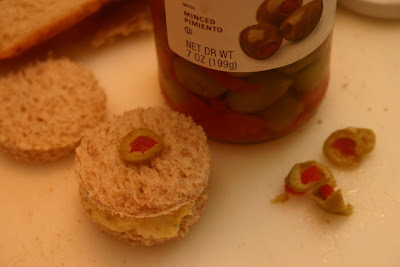 Cut out circles or other shapes in wheat bread, spread filling, then garnish with a slice of olive. Makes enough spread for 3 to 4 dozen small tea sandwiches. My sweet nieces Madison, Cari and Amelia are some of my favorite tea party playmates in the whole world, and since today is Cari's ninth birthday, I took the morning off and seven of us gals in my family gathered for a special birthday tea. We had a little teacup sign out front reading "HAPPY BIRTHDAY, CARI!" 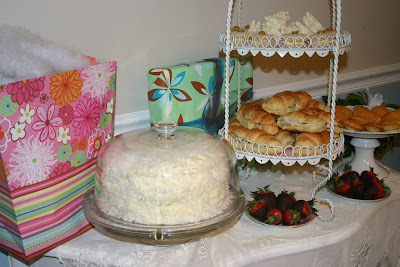 Because it was her big day, Cari's place setting had the Birthday Cake Teapot my thoughtful friend Stacie gave me recently just because she came across it and thought I'd like it. 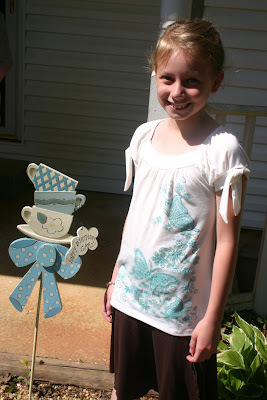 Isn't that a great teapot to use in honor of The Birthday Girl at tea parties? Cari got to request any tea she wanted, and I was very relieved when she said "Peach" since I had three different varieties on hand. 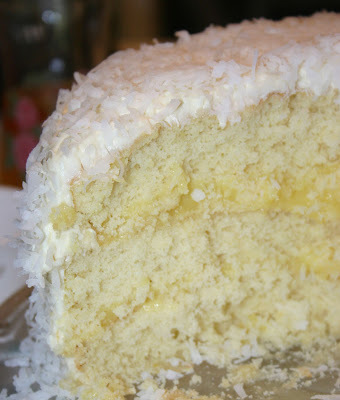 Cari had requested the Southern Living Coconut Cake I made last Thanksgiving, one of their "big white cakes" with lemon curd between the layers and a yummy cream cheese frosting. 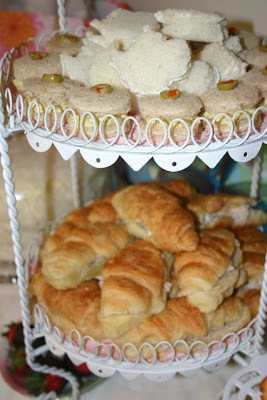 We also had Egg-Olive Tea Sandwiches, Cucumber Cream Sandwiches, Waldorf Chicken Salad Mini-croissants, Lemon Madeleines and Chocolate Covered Strawberries. The drink offerings included ice water (we're big ice water girls), iced Key Lime Rooibos, Peach Tea and Chocolate Mint Tea. 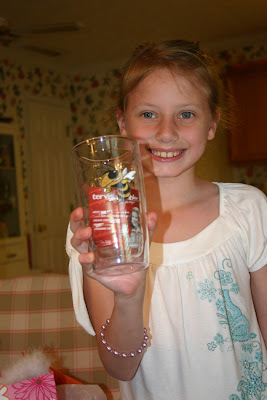 ... and from Uncle Alex, a Georgia Bulldog fan, she managed to get a much-treasured Georgia Tech Yellow Jackets glass. "That's disgusting!" said Madison, age 12, a Texas Longhorns fan and someone who doesn't much care for the Yellow Jackets despite the coloring on her groovy outfit. Amelia, who is nearly 3, didn't care about college rivalries. 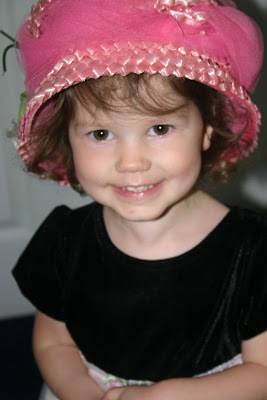 She just wanted to try on hats and high heels and dance to Barney songs! And that's enough for today, but tomorrow I'll share some of the recipes for those who like that sort of thing! 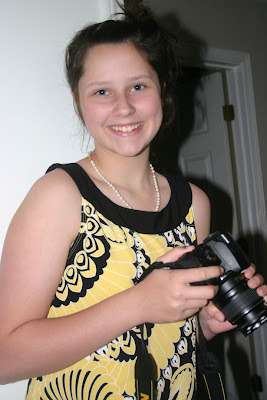 My interview with "Tea Party Girl"